On February 24, the Senate approved a $15 billion Jobs Bill deemed to be a legislative victory. While it might be the first truly bipartisan measure we have seen for a long time, the important question is whether it will solve the unemployment problem. The centerpiece of the bill (worth $13 billion) is a payroll tax cut to businesses for hiring new workers. It seems that the bill is based on the good old neoclassical reasoning that the unemployment problem will be solved by lowering wages. Tax credits will supposedly lower the labor costs for businesses thus spurring hiring. Unemployment, however, is not due to high wages but is rather caused by insufficient aggregate demand. When the aggregate demand is low, businesses can’t sell what they produce, therefore they cut back on production and fire workers. Lowering wages won’t help, because if the businessmen don’t expect to sell their products, they won’t hire new workers, regardless of how low wages are. 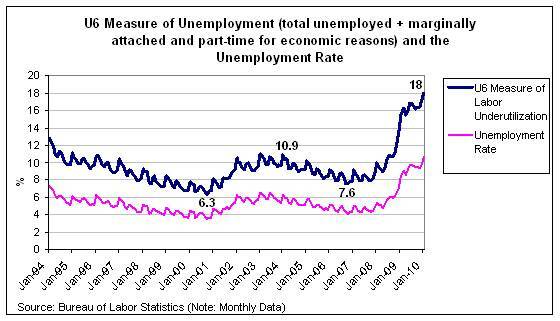 So while unemployment rate is about 10% with alternative measures of unemployment reaching 18% in January 2010, the government hopes that a measly $15 billion bill centered on payroll tax credits will help alleviate the problem. Well, it won’t. The graph below shows the narrowest and most comprehensive measures of labor underutilization for the period 1994 to 2010. The U6 measure of unemployment unfortunately only goes back to 1994, so we can’t really know what the historical lows are. However, the current number of 18% looks pretty high. During the previous recession of 2001 the U6 measure went up from its all time low of 6.3% to 10.9%, only a 4.6% increase. This time the increase from trough to peak has been over than 10%, more than twice the previous increase of 4.6%. The annual unemployment rate for 2009 was 9.3%. That was much larger than the Post-WWII historical average of 5.6% (1948-2008). People who have been unemployed 27 weeks and longer were 41.2% of the unemployed, double of the January 2009 number of 22.4%. A small tax credit based policy similar to the current proposal will not work; it never has. On the other hand, we know what works from past experiences. Direct job creation by the government, similar to the Works Progress Administration (WPA) of the New Deal, will have immediate and direct effects on incomes and jobs. Instead of paying unemployment benefits and tax credits, the federal government should offer to hire anyone who wants to work at the federal minimum wage. A universal jobs program will get the economy going. The benefit of a government jobs program is that the government doesn’t need to be profitable, unlike businesses. Profitability is the criteria for judging the success of a private firm; an unprofitable business cannot last long. The Federal government, however, doesn’t need to make profit off of its employment projects. This doesn’t mean to say that it should be wasteful. Rather, government programs should be evaluated under different standards and criteria, not profitability. One of the purposes of a democratic government is to supply public services to its citizens, and if a job guarantee program can succeed in doing that, then we could rightly argue that it is effective and “profitable”. So what services could the government provide? The most obvious one that comes to mind is to improve the infrastructure. A study done by the American Society of Civil Engineers, gave the American Infrastructure a D grade point average. None of the 15 infrastructure categories evaluated had a grade above C+. We will need to make 2.2 Trillions of Investment over five years to improve the conditions of our bridges, dams, roads, schools, drinking water, etc. So why not start from there? Why not hire everyone who wants to work to improve the American infrastructure? This will give people earned income (not handouts by the government that have a shelf life of a banana), will help stop foreclosures and bankruptcies and will get the economy going. Without a direct job creation program, it looks like the economy will continue in this recessionary environment for a long period of time. Even most optimistic commentators predict to see another jobless recovery. I would go even further and argue that the U.S. economy needs such a Job Guarantee program during the “good” times as well. You might say that usually the economy fares pretty well in providing employment; the US has one of the lowest unemployment rates among developed countries, even reaching lows of 3.7% once in a while. But if you look at the U6 measure of unemployment which is by far a more accurate measure of labor underutilization, the lowest it has been since 1994 (the period of the so-called Great Moderation) was 6.3% at the peak of the NASDAQ boom. Hence even in booms, the private sector doesn’t produce enough jobs to employ everyone who wants to work (and I’m not even talking about the quality of jobs). We won’t see another bubble of the same magnitude as the housing bubble, the US won’t become a major exporter, consumers are deleveraging, people’s incomes aren’t growing to support income induced consumption. So what will take the U.S. economy out of this recession? Construction, banking and manufacturing, traditional job creating industries don’t offer much hope this time. If we want to have a fast recovery that will also provide jobs, why not start with a federal Job Guarantee program? President Obama said in an interview that he was hoping that the American people would understand him if he just focused on the right policies. Well, if he really did, maybe Americans would understand him, especially those who would finally be able to get jobs and a source of income. Let’s try a Job Guarantee Program and see what all the jobless Americans have to say. In 2005 tax revenues were humming, with a growth rate of 15% per year—far above GDP growth–hence, reducing nongovernment sector income—and above growth of government spending, which was just above 5%. As shown in the figure above, such fiscal tightening invariably results in a downturn. When it came, the budget deficits increased, mostly automatically. While government consumption expenditures have remained relatively stable over the downturn (after a short spike in 2007-2008), the rate of growth of tax revenues has dropped sharply from a 5 % growth rate to a 10 % negative growth rate over just three quarters (from Q 4 of 2007 to Q 2 of 2008), reaching another low of -15% in Q1 of 2009. Transfer payments have been growing at an average rate of 10% since 2007. Decreasing taxes coupled with increased transfer payments have automatically pushed the budget into a larger deficit, notwithstanding the flat consumption expenditures. These automatic stabilizers and not the bailouts or much-belated and smaller-than-needed stimulus are the reason why the economy hasn’t been in a freefall á la the Great Depression. As the economy slowed down, the budget automatically went into a deficit putting a floor on aggregate demand. As estimated by the New York Times, even if we were to eliminate welfare payments, Medicaid, Medicare, military spending, earmarks, social security payments, and all programs except for entitlements, and in addition stopped the stimulus injections, shut down the education department, got rid of a number of other things and doubled corporate taxes on top of all of this, the budget deficit would still be over 400 billion. This further demonstrates the non-discretionary nature of the budget deficit. And of course this doesn’t take into consideration how much more tax revenues would fall and transfer payments would rise if these cuts were to be undertaken. With the current automatic stabilizers in place, the budget cannot be balanced, and attempts to do so will only cause damage to the real economy as incomes and employment fall. In recent weeks there has been much discussion about what to do about Greece. These questions become all the more relevant as the country attempts to float a multibillion-euro bond issue later this week. The Financial Times has called this fund-raising a critical test of Greece’s credibility in financial markets as it battles with a spiraling debt crisis and strikes. (see here) The “credibility” of the financial markets is an important consideration in a country which has functionally ceded its sovereign ability to create currency, and thus remains dependent on the vagaries of the very banking institutions which helped create the mess in the first place. And it is questionable whether any of them provide long term viable answers. Polls show that given the perception of fiscal excesses of Greece and the other countries on the periphery, the public in Germany opposes a bailout of these countries at its expense by a significant margin. Periphery countries such as Ireland that have already undertaken harsh austerity measures also oppose the notion of a bailout, despite—nay, because of–the tremendous pain already inflicted on their own respective economies (in Ireland’s case, the banks are probably insolvent as well). The IMF route is also problematic, given that Greece probably doesn’t qualify under normal IMF standards, and many euro zone nations would find this unpalatable from an ideological standpoint, as it would mean ceding control of EU macro policy to an external international institution with strong US influence. The Wall Street Journal recently highlighted an article by Simon Johnson and Peter Boone, lamenting that the demands being foisted on Greece and other struggling Euronations would “massively curtail demand, lower wages and reduce the public sector workforce. The last time we saw this kind of precipitate fiscal austerity—when nations were tied to the gold standard—it contributed to the onset of the Great Depression in the 1930s” (see here). Where we disagree with Johnson and Boone is the suggestion that the IMF be brought in to craft a solution. Any help from this organization will come with tight strings attached—indeed, with a noose around Greece’s neck. Germany and France would be crazy to commit their scarce euros to a bail-out of Greece since they face both internal threats from their own taxpayers and external threats from financial vampires who are looking for yet another nation to attack. Some might believe the term “banksters” is too mean. Surely Wall Street was just doing its job—providing the financial services wanted by the world. Yes, it all turned out a tad unfortunate but no one could have foreseen that so many of the financial innovations would turn into black swans. And hasn’t Wall Street learned its lesson and changed its practices? Fat chance. We know from internal emails that everyone on Wall Street saw this coming—indeed, they sold trash assets and placed bets that the trash would crater. The crisis was not a mistake—it was the foregone conclusion. The FBI warned of an epidemic of fraud back in 2004—with 80% of the fraud on the part of lenders. As Bill Black has been warning since the days of the Saving and Loan crisis, the most devastating kind of fraud is the “control fraud”, perpetrated by the financial institution’s management. Wall Street is, and was, run by control frauds. Not only were they busy defrauding the borrowers, like Greece, but they were simultaneously defrauding the owners of the firms they ran. Now add to that list the taxpayers that bailed out the firms. And Goldman is front and center when it comes to bad apples. Lest anyone believe that Goldman’s executives were somehow unaware of bad deals done by rogue traders, William Cohan (see here) reports that top management unloaded their Goldman stocks in March 2008 when Bear crashed, and again when Lehman collapsed in September 2008. Why? Quite simple: they knew the firm was full of toxic waste that it would not be able to continue to unload on suckers—and the only protection it had came from AIG, which it knew to be a bad counterparty. Hence on March 19, Jack Levy (co-chair of M&As) sold over $5 million of Goldman’s stock and bet against 60,000 more shares; Gerald Corrigan (former head of the NY Fed who was rewarded for that tenure with a position as managing director of Goldman) sold 15,000 shares in March; Jon Winkelried (Goldman’s co-president) sold 20,000 shares. After the Lehman fiasco, Levy sold over $6 million of Goldman shares and Masanori Mochida (head of Goldman in Japan) sold $56 million worth. The bloodletting by top management only stopped when Goldman got Geithner’s NYFed to produce a bail-out for AIG, which of course turned around and funneled government money to Goldman. With the government rescue, the control frauds decided it was safe to stop betting against their firm. So much for the “savvy businessmen” that President Obama believes to be in charge of Wall Street firms like Goldman. But it gets even worse: An article by the German newspaper, Handelsblatt, (“Die Fieberkurve der griechischen Schuldenkrise”, Feb. 20, 2010) strongly indicates that AIG, everybody’s favorite poster boy for financial deviancy, may have been the party which sold the credit default swaps on Greece (English translation – here). Having been bailed out by the Obama Administration, Wall Street firms are already eyeing other victims (and for allowing these kinds of activities to continue, the US Treasury remains indirectly complicit, another good reason why one shouldn’t expect any action coming out of Washington). Since the economic collapse is causing all Euronations to run larger budget deficits and at the same time is raising CDS prices and interest rates, it is easy to pick off nation after nation. This will not stop with Greece, so it is in the interest of Euroland to stop the vampires now. With Washington unlikely to do anything to constrain Goldman, it looks like the European Union, which is launching a major audit, just might banish the bank from dealing in government debt. The problem is that CDS markets are essentially unregulated so such a ban will not prevent Wall Street from bringing down more countries—because they do not have to hold debt in order to bet against it using CDSs. These kinds of derivatives have already brought down an entire continent – Asia – in the late 1990s (see here), and yet authorities are still standing by and basically doing nothing when CDSs are being used again to speculatively attack Euroland. The absence of sanctions last year, when we had a chance to deal with this problem once and for all, has simply induced even more outrageous and fundamentally anti-social behavior. It has pitted neighbor against neighbor—with, for example, Germany and Greece lobbing insults at one another (Greece has requested reparations for WWII damages; Germany has complained about subsidizing what it perceives to be excessive social spending in Greece). If these are examples of Obama’s “savvy businessmen” (see here), then heaven help the global economy. The transaction highlighted, if reported that way in the private sector, would be accounting fraud. Fraud – “Go to jail, do not pass Go” fraud. That senior bankers had no problem in structuring/recommending/selling such deals to cash-strapped governments should probably not surprise us at this point. However, it would be interesting to know if the prop trading desks of those same investment banks, purely by coincidence of course, then took long CDS (short the credit) positions in the credit of the countries doing the hidden swaps. A proper legal investigation by the EU could reveal this and certainly help to uncover much of the financial chicanery which has done so much destruction to the global economy over the past several years. Dimitri Papadimitriou has recently made what we consider to be an important plea for moderation of the hysteria about Greece’s debt. Writing in the Financial Times, he complained that “The plethora of articles in your pages and others, some arguing in favour and other against a bail-out, contribute to market confusion and drive the country’s financing costs to record levels. It is not yet clear that a bail-out is even needed, but this market confusion is rendering the government’s ability to achieve its deficit goals ever more difficult.” Indeed, we suspect that the same financial firms that helped to get Greece into its predicament are profiting from—and stoking the fires of—the hysteria. He goes on, “what Greece really needs now is a holiday from further market confusion being created by contradictory, alarmist public commentary” (see here). Greece, Euroland in general, and the rest of the world all need a holiday from the manipulation and destruction of our economies by Wall Street firms that profit from speculative bubbles, from burying firms, households, and governments under mountains and debt, and even from the crises that they create. Governments all over the globe should use all legal means at their disposal to ferret out the bad faith and even fraudulent deals that global financial behemoths are foisting on us. CAN OR SHOULD THE FEDERAL GOVERNMENT BALANCE ITS BUDGET? Nowadays the only thing on everybody’s mind is the level of government deficit and national debt. Deficit hysteria is being fueled by reports that the US budget deficit will reach “an all time high” this year. President Obama is going to appoint his own commission to study how to reduce the deficit—since Congress failed in its attempt to establish one. He frets that we will leave crippling mountains of debts for our grandkids. The deficit hysteria hydra is too big to cover in one blog—but here we will address the “deficit cycle” and the possibility of ending it. There seems to be a deficit mania cycle with hysteria arriving after every recession (because, as we show below, recessions always generate big deficits), only to recede when economic growth resumes and deficits fall. And the fact that there is a Democratic president in office and a largely Democratic congress frees the hands of conservative deficit hawks who complain about spending profligacy and growing national debt (they usually fail to recall that much of this spending and especially tax cuts have been generated under a Republic president and Congress, not to mention the 780 billion Paulson bailout of Wall Street). This deficit hysteria is also a useful tool for distracting people’s attention from really important matters, such as a 10% unemployment rate, the possibility of a double-dip recession, underwater home owners, and rising mortgage delinquencies. Can the government really balance its budget and run continuous surpluses for a number of years as some politicians promise to do? Here is some data to help you decide that for yourself. Every time the government has tried to balance its budget, the economy has fallen into a recession which has caused the automatic stabilizers to kick in and grow the budget deficit. The graph below depicts the federal budget deficit (or surplus) as a % of GDP with signs reversed (a surplus is below zero, a budget deficit is shown as above zero) and recessionary periods for the entire post-war period. As can be observed in this graph, every budget surplus over this period has preceded a recession. 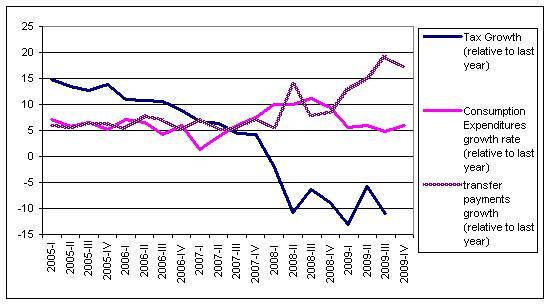 The remaining recessionary episodes have been preceded by reduction of the deficit to GDP ratios. Further, every recession except the one in 1960 led to a budget deficit; the 1960 recession was followed by a reduction of the budget surplus. These movements of the budget balance are due to automatic stabilizers. When the economy slides into a recession, tax revenues start falling as economic activity declines. Social transfer payments, particularly unemployment benefits, on the other hand, increase, again automatically, as more people loose their jobs. On the other hand when the economy begins to grow, tax revenues grow quickly, moving the budget toward balance or even to a surplus. While government consumption expenditures have remained relatively stable after a short spike in 2007-2008, the rate of growth of tax revenues has dropped sharply from 5 % growth to 10 % decline in just three quarters (from Q 4 of 2007 to Q 2 of 2008), reaching another low of -15% in Q1 of 2009. Transfer payments, as expected have been growing at an average rate of 10% since 2007. Decreasing taxes coupled with increased transfer payments have automatically pushed the budget into a larger deficit, notwithstanding the change in consumption expenditures. These automatic stabilizers and not the bailouts or much-belated and smaller-than-needed stimulus are the reason why the economy hasn’t been in a freefall similar to the Great Depression. As the economy slowed down, the budget automatically went into a deficit putting a floor on aggregate demand. Conclusions: the federal government budget cannot be balanced or turned into surplus without killing the economy and causing another Great Depression, which again, will automatically cause the budget to turn into the negative territory. With the loss of 8 million jobs, and given the private sector’s unwillingness to go further into debt (it is now, finally, spending less than its income) there is no way that the federal budget can be balanced, unless the US becomes a net exporter, which is highly unlikely. So if a politician tells you that she is going to balance that budget, she either doesn’t understand what she is talking about or is trying to fool you to get elected.